You don't have to be a radiologist to see what's wrong in THIS picture. While the pictures above are a fun way of showing a price difference, its a very real scenario in Massachusetts. The fact is that the price of an MRI in Massachusetts can vary as much as 65% for the EXACT same scan – the same technology, the same body part, even the same time of day. The purpose of an MRI is to look deeper; perhaps it’s time for consumers to do the same – to their MRI bills. With about 45% of Massachusetts employers offering a high-deductible plan, more people might be doing just that. A high-deductible health plan means that patients are paying for the whole cost of their MRI or other healthcare procedure until they reach their out-of-pocket deductible. The average deductible for a family in Massachusetts is $4,000. Choosing a high-cost MRI provider could wipe that deductible out in just ONE appointment! One skiing or shoveling injury in January could wipe their deductible in almost one payment! While the concept of finding the best quality for a low price isn’t revolutionary to almost any industry (think T.J. Maxx, Marshalls and Wrentham outlets), the healthcare market is struggling to keep up. Chances are you’ve scoured gas stations to save a few cents on the dollar, but would never think to save thousands of dollars by checking the price of a medical test. But the industry IS trying. Since the fall of 2014, Massachusetts insurance providers have been required to provide their customers access to pricing information. It’s a great step in the right direction, but patients are often given price ranges or search for a service and provider to find that the information is not available. The bottom line is that it’s difficult to be a smart health care consumer in Massachusetts! At Shields we see it every day – people come to their appointment with little knowledge of how much of the bill they are responsible for, whether they have a co-pay or coinsurance. And we understand - it’s a lot of effort for a patient that is not feeling well and often scared about the results of their exam! So back to the pictures at the top of this post – the same scan, the same technology, a wildly different price. What gives? Why can a provider like Shields offer a price that more than $1,500 LESS? Very simply, Shields MRI is laser focused on MRI. This means more efficiency and that translates into savings for our patients. Hospitals offer multiple service lines with high overhead costs that often filter down into the price for your imaging. As a specialty outpatient provider, our costs are low and our expertise in MRI is truly unmatched. Out-of-pocket estimates through our specialized software. You can call our patient financial services team and get your co-pay, coinsurance or deductibles within minutes. Bonus savings through our complimentary parking and other features like same-day appointments that save time and money. We understand that being a consumer in today’s healthcare world is not easy – there is a lot of information out there. 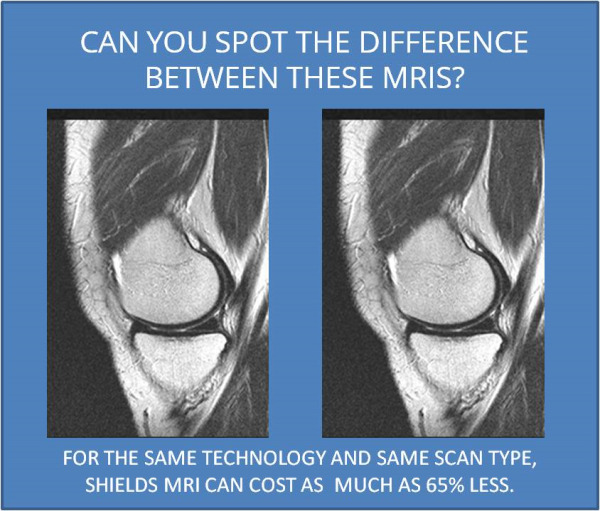 Shields has made it our mission to offer the very highest-quality MRI at an accessible price. It’s a model that grants our patients the peace of mind to focus on what really matters: better health. *Source: Shields pricing information comparing Boston teaching hospital price for an MRI of the spine with and without contrast for a patient with commercial insurance from a leading MA insurance carrier. Prices reflect average estimates. Shields pricing estimates are global and will vary a little depending on location; 2014 Massachusetts Center for Health Information and Analysis Report.